It started out today in the Midwest as a typical English winter day (historically grey and wet, not the bitter cold and snow they are currently having). This reminded me that Washington was supposed to have an English sort of climate, so having spent the last few weeks looking at New England temperatures, it seemed it was time to see what happened on the other side of the country. And so the state I am looking at today is Washington. And since it has been a while since I tried a hypothesis, here is a new one. 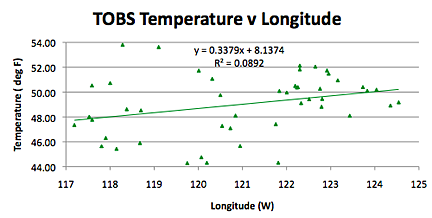 Over on the East coast, as the stations moved West the land rose and the correlation with longitude was negative. I am going to suggest that the correlation with longitude is really one with elevation, and thus, on the West coast the temperature will increase with longitude (since the land is sloping towards the sea). The first surprise was in the number of stations that there are, the USHCN website gives 44, from Aberdeen to Winthrop. (Incidentally the page has a flaw since it includes W.Va stations on the same page). 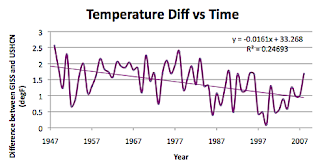 However, nothing loath I downloaded these and put both the homogenized mean temperature for each station and year into one table, and the Time of Observation corrected raw data into another. Then it was time to find the GISS stations. 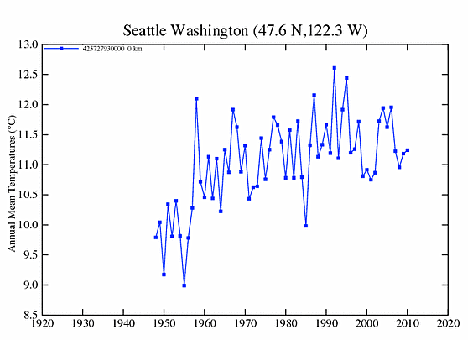 What is odd about it is that the USHCN data that I have just downloaded for Seattle goes back to 1895, and this only shows data back to 1948. (Which makes 2 of the 3 stations checked so far). Okay, so how about Quillayute. Well it doesn’t show on the list, and when I do a search for it using the station selector it doesn’t come up either. So I do a Google search to find out where it is (near Port Angeles) and then I go to the Port Angeles station and do a search for adjacent stations, and there it is. 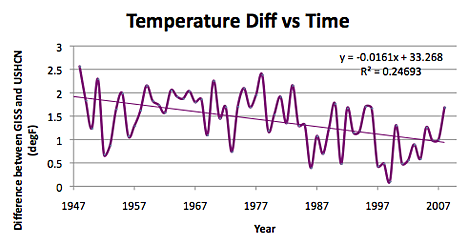 But it only has data since 1968. 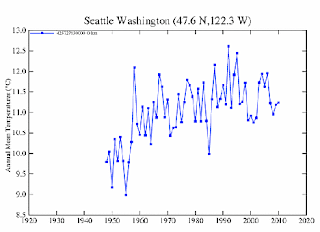 So with 44 stations available in Washington, GISS is only using stations that have records within the past 60 years? 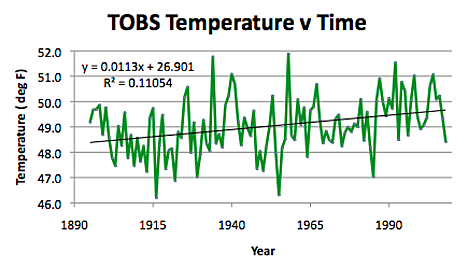 Oh, and one minor thing – it is not yet the end of 2010, but the GISS records for the year are posted. 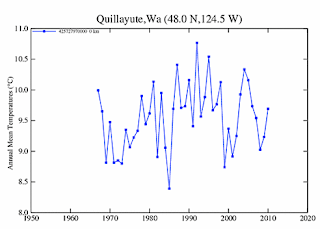 For example this is the end of the station record for Quillayute – I have folded and cut the spreadsheet so that you can see, in the second row, for each year, the average temperatures for November, December and for the whole year. You will notice that the data for 2010 is already present. 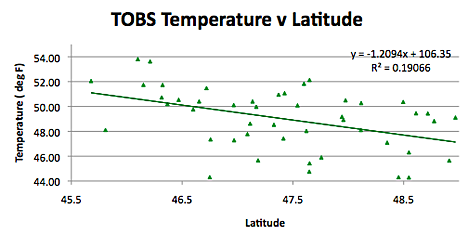 Part of the GISS temperature record, the last line shows the average temperatures for the station for November, December and the average for the year 2010. The screen capture was taken on the 11th December 2010. Well all that being said it is going to make the analysis a little difficult in comparing GISS and USHCN numbers, but let’s be at it. 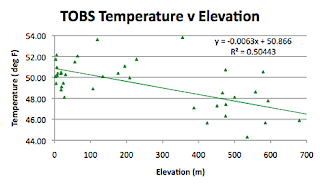 Because of the limited range of the GISS data, the correlation can only be made over the past sixty years, and it does show a change with time. 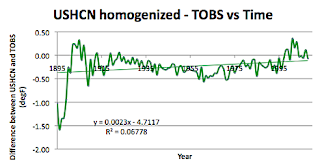 (This is the homogenized USHCN average that is being plotted). For the state itself, plotting the TOBS data over time. 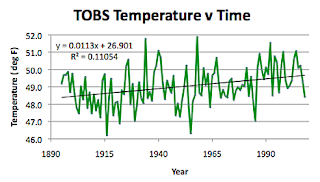 The temperature has been rising at around 1.1 deg per century, with the highest temperatures in 1934 at 51.8 degF and 1958 at 51.9 degF. 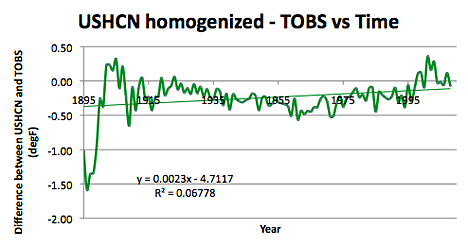 The homogenized data, on the other hand shows an overall temperature rise at a rate of 1.36 deg per century, with the peaks both being at 51.5 degF. 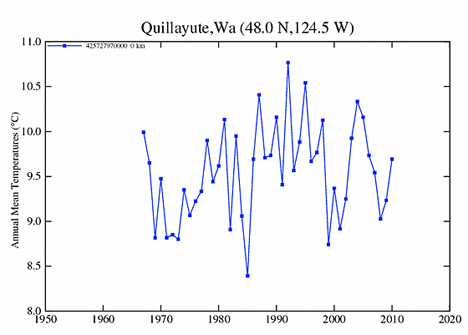 Moving on to the geographical influences, Washington lies between 45.5 deg and 49 degN, and 117 and 124.75 degW. It is 360 miles long and 240 miles wide, and the average elevation is 518 m above sea level. (Mount Washington being at 4,392 m). 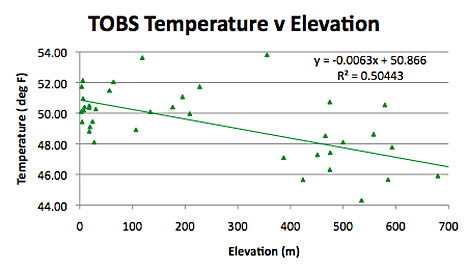 The average station elevation is 297 m (the GISS station average is 130 m). And, bless my sox, so it is. In getting the data for the population there were several places where the indications were that the particular location had no inhabitants, however by going to the maps they were generally near small communities, so I either used that data or in four cases after looking at the map inserted either 1, 10 or 100 (generally there I could find a number if the community was larger than 100). But a power station was a little troubling since there was a lot of power fairly close – hence the 100. 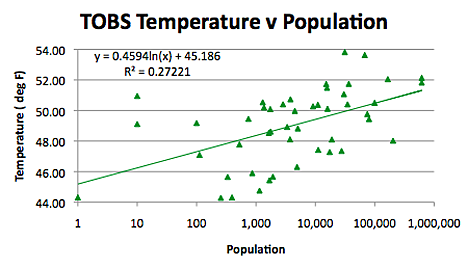 Given the range of populations and elevations, the correlation with population is I believe significant, though the three points at the low end are a little questionable in regard to the actual size of those populations. (Airports and power station dams may have an impact). And a final comment – I went out late this afternoon, in the middle of writing this, and the temperature outside was 50F when I left the house. By the time I was back an hour later it was down to 32F and it was 27F when we came back later this evening. So we are still trying to emulate British weather! !